Welcome to The Mitchell Archives, containing five centuries of original historic newspapers. Take a fascinating trip back through the portals of time, where you can see, read, and even touch history-making events exactly as they unfolded, just as our ancestors experienced them! With an inventory of more than 20,000 original newspapers, The Mitchell Archives covers almost every aspect of American and World History, including an unprecedented selection of some of the most important people and events ever offered. And, what’s truly extraordinary, you can now purchase for yourself, your family, friends, or clients, pieces of history normally found only in major museums or institutions. A historic newspaper makes a most unusual and thoughtful special gift, as many of our clients will attest. Coming soon: I'm in the process of building a comprehensive and timely collection from each of the presidential elections and/or terms from George Washington onwards. The U.S. Presidential Election Collection will contain many rare editions, including error papers, and will be available for sale exclusively through The Mitchell Archives. 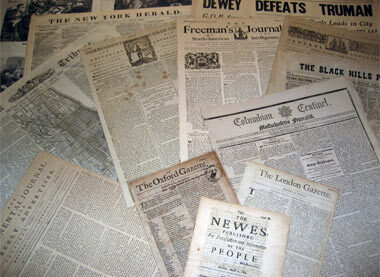 Typical American newspapers from the 18th and 19th centuries were four to eight pages in length, and carried no banner headlines. Headlines as we know them today did not generally appear until the yellow journalism era, in the late 1890's. Mark E. Mitchell is one of the leading authorities on original historic newspapers and regularly consults on newspaper value, scarcity and authenticity. His rare inventory contain some 20,000 complete issues dating from the early 1600s to present day.